The world is running towards change every day in terms of technology. The most important things in the world right now are internet and technology. Humans now depend more on the internet for information regarding anything. In this article, we will discuss in detail how Google has given us the two important products which are amazingly interesting and surely worth buying which is termed as GOOGLE HOME AND GOOGLE WI-FI. The technology is so advanced nowadays that you can control any device through the internet. Did you ever think of watering the plant in your garden when you are working in your office? Well, I can tell you that you can do a lot more than that. I will explain how it is possible in detail later in this article. The Google home is a Smart Speaker. It has extremely good and high-quality speakers on the bottom part of the device. The most important thing that this device has is Google Assistant. You can give voice commands to this tiny device and it will do almost everything you want. Google Assistant is a voice based conversational way to command your device. It is more like an artificial intelligence but not completely. The device is smarter enough to help you out in any way. Google is well-known for its search engine because whatever doubt comes into our mind the first thing we do is “Google it”. So basically everything we want is available on the internet, we just have to type it. But now with GOOGLE HOME you need not even type it. You just have to ask it and rest is taken care of. We can say Google Assistant is a sibling of “Google now”. Google now is used widely in all ANDROID phones for using the device in an effective way. But Google assistant on another hand can do quite lot more than that. If you buy Google home you can see that it is the only product by Google which does not have a touch screen to configure it on-screen. It is because everything is done by an application called Google home. The setup is quite simple, you have to connect the power chord of the device at first. Download the application of Google home on your phone and then it will automatically find any Google home devices present near by and it will connect to it. The internet access will be taken by the Google home device. After that, you have to give a name to the place you have placed the home device. You must be thinking why I will tell you how smart this device is in the further sections. That’s it you are good to go. What to do with it?? The answer is not simple and small, so I will try to break down and make it as easier as possible to understand. Everyone likes to have an assistant who will do any kind of work assigned. Google Assistant is smarter Assistant and is family friendly in nature than any other assistant present till now in the market. Google assistant talks with us in a female voice which can be the best voice-based assistant according to me. Trust me, it’s too good and fascinating. Why?? Let’s see what all it can do for you. So let’s dive into the real interesting part of the device. The GOOGLE HOME wakes up every time you say OK GOOGLE! or HEY GOOGLE!, and after that, you can ask it anything you want or you can even tell anything you want to it and it will reply back within no time and that too very politely. Well, this is the best part, because it totally left to your imagination. You ask it the distance from your location to moon, the temperature outside, how is the day, it will tell everything. You can ask it any questions you want to, like, How much time it will take for a human being to walk around the globe? The size of the football, sing happy birthday for you, place where you will get the product you want. You can even ask it to check whether a shop is opened or not at that particular time. Can search for places nearby you, where to eat and it will show all the places nearby you which can provide you food. You can ask it about a director of a film, the role played by a particular actor in that film. You can ask it to do calculations for you, tell the news headlines for you. Also, you can ask who won the match the previous day or the match status currently going on. You can even ask it to book a uber cab for you. What not? Everything and anything. If you feel bored you can ask to crack a joke for you too. You can command it like you want and the best part is it will do anything you say. So basically it is like you can search online about anything and everything without even typing anything, the only thing you have to do is say “OK GOOGLE” and that’s it! you can check your imagination levels just by asking a question. HEY GOOGLE play Titanic movie on my T.V, play my morning songs playlist, play how to cook chicken on my T.V, it will do all these. The search engine of this device is too good, that is why you can ask anything you want and the answer is ready for you. If it does not understand or if it does not know, it will tell politely that right now it does not know. This gives a clear picture that Google is going to give updates continuously to the device to make it as perfect as possible. Everyone likes to listen to music according to the mood they are in. You can ask Google home to play a song for you. Remember I told that you have to name the place where the device is placed? Well, you will now understand how it is useful. If you have another Google home device in your home and is placed somewhere in other room, you can tell the device to play a song in that room and it will do it. You can even tell it the volume to be set while interacting, you need not even touch it. Even if the volume is full and you can’t even hear what the other person is saying to you properly, if you just say “OK Google STOP!” it will stop immediately. Humans have the tendency to forget things a lot. We forget about the important dates, grocery items list to buy, meetings, birthdays, appointments and what not. Here Google home comes with basic features like you can tell it to mark an event in the calendar, you can tell it to remind you of a particular meeting at the particular time, you can tell it to set a reminder, set an alarm, start a counter. You can tell it to add the list of items to the shopping list. Yes, You can tell anything to it that you are afraid that you will forget, it will remind you without any failure. You can tell Google home to play a particular recipe from YouTube on the T.V (only for chrome cast enabled) it will play the video on the T.V. You can also tell it to play your favorite season on NETFLIX. IoT means INTERNET OF THINGS. Presently this is the latest technology which is giving scope for further development and manufacturing of various products. As I told I will tell in very simple words, any IoT device can be controlled remotely from any place through the means of internet. That’s why I told, you can even water your plant when you are in office. In technical words, every device in the world can be allocated one IP address and it can be controlled using a variable number of micro controllers and microprocessors by accessing the internet. I will not explain further technical things because it is out of the scope of this article. The reason I told this is that you can control home appliances just by telling to Google home. There are many IoT based devices coming out in the market. There is just a small process to make everything in your home to work just through voice commands. You have to buy a HUB which will connect your devices to the internet. You just have to add the IoT devices to the Google home app and name the device like you want. Using that name you can control the device just by saying OK GOOGLE! There are switches available which you can replace with the normal switches available and you can add that switch to your app and you can sit in a room and tell to the Google home to turn on that particular switch. The smart T.V’s, smart washing machine, smart A.C’s, smart door locking system, smart kitchen, all these can be controlled by google home. 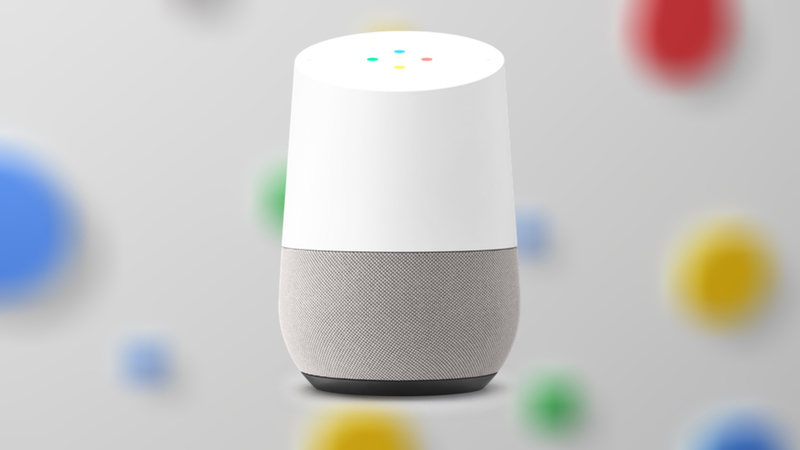 The music we ask the google home to play will be played from Google Play Music, Spotify, iHeartRadio. The videos we ask it to play will be done through YouTube and Netflix. The calendar updates and reminders are done through the Google Calendar and Google keep. This all is done through the google account that you have and through which you have downloaded the Google home app too. It supports multi-users too. So all the people of your family can use the device without any problem. As said it is so smart that it can recognize the name of the particular person from the voice. It allows six Google account holders to connect to it. So even if you tell call my father, it will understand from your voice and call your father instead of calling your father’s father. The home automation is supported by the devices like Chromecast and also the devices from the manufacturers like Nest, SmartThings, Philips Hue, GE, LIFX, LightwaveRF, Logitech Harmony. Even though the list is small now, it may increase in future. GOOGLE has given an update which allows users to make the hands-free call to the contact list. This was given in some countries. The size of the Google Home is around 5.62 inches long and the shape is like cylindrical and its weight is around 480 grams. The upper part of the device consists of some LED’s which glow whenever we talk with Google Assistant and it has a capacitive touch screen on top which allows us to control the volume by hands too and also you can start or pause music by tapping on the middle. It also has two micro phones for far voice recognition. That means you can talk from the far distance also. People like their privacy a lot. No one wants Google to listen to every conversation we are having so Google has provided a MUTE button which will mute the device. The bottom half has speakers to it and the outer part is removable and that is the only part which is available in some different colors. The Google Home is available on AMAZON which can purchase from below products. When I sit in my room and access YouTube from my mobile the streaming rate is very slow and when I sit in the front room the speed is very fast. Did it happen with you? The reason is when I sit in the front room the router is near to the device and the range is nearer. So the antennas on top of the router are able to transmit signals with high strength to the device but when the distance increases the speed decreases. There are also some weak points or dead points in a home where the connection gets terminated. Google has come up with the device GOOGLE Wi-Fi which is a mesh-capable wireless router. In simple words like the mesh covers the huge area under it. This device covers the complete home under the mesh blanket. Google WiFi is amongst the top mesh wireless systems. The interesting part is this device can be controlled by a Google wi-fi app in more effective manner and the app gives lots of useful information too. Google always do the hard work for us and makes our life simpler in many ways. Here also the setup process will take around 10 minutes only. The device has to be connected to the modem with the ethernet cable first. Then the app has to be downloaded. Let the app scan its surroundings and find the device or just scan the QR code on the device and set the password for it. THAT’S IT!!! The main part of the setup is done. The solution that google came up was making the device mesh-capable and removing the dead spots or no wi-fi zones by placing one more GOOGLE Wi-Fi so that the coverage area is increased. You can place the routers according to your home dimensions and the coverage of a single router. All you have to do is place the router and add that to the app. You can also provide it a name that you want. With this, you can access the internet from every corner of the house without any decrement in the speed. The hand-off from one router to other router is done so fastly that the device will not even get disconnected from a router. The switching process is that fast. Even if you stand beside the router or far away from it, the download and upload speed will not decrease a bit. The internet speed will be constant throughout the home. As explained earlier this app makes the complex part look very simple. That is why it is very user-friendly. The application shows you the number of devices connected to it and also the number of access points connected to the main router. It shows the data transfer rate and also information about the update of the software. This allows the mobiles connected to the router choose the least congested channel for getting the data. It uses both 2.4 and 5 Hz frequency. It is responsible for the smooth hand-off between one access-point to the other. Well in my opinion this is the best thing in the application. Generally, you can create a group where you can add the members of the family under it. Every parent wants to control their kids by giving some limited time of access to the internet. So what GOOGLE did is, it gave an option to pause the internet for a particular device or a particular group for given particular time. So you can block your kid’s wi-fi access while having dinner or you can restrict the internet timings as you need. The app also allows you to give the timing access before hand only to particular group or device. The design of Google Wi-Fi is the best because unlike the other routers it does not have big antennas outside. The device is cylindrical in shape and it has one type-C port and two ethernet cable ports. The device looks very elegant in its manner. It weighs 340 grams only. The LED’s can be turned off if you want it to do so while sleeping. So that’s another plus point. The routers are available in a set of three also. According to the dimensions of the home, you can decide how many to buy. 1 router can cover 500-1500 square feet, 2 routers can cover 1500-3000 square feet and 3 routers can cover 3000-4500 square feet. The Google Wi-FI is available on AMAZON and can buy from below products. Google Assistant has already beaten Siri, Alexa in many aspects. So, you should understand the power of it and how it can evolve more in future. If you want to have a complete smart home, then there is no other best product available in the market till date. The services provided by Google Home are incredible. Every penny you pay for it is worthy. 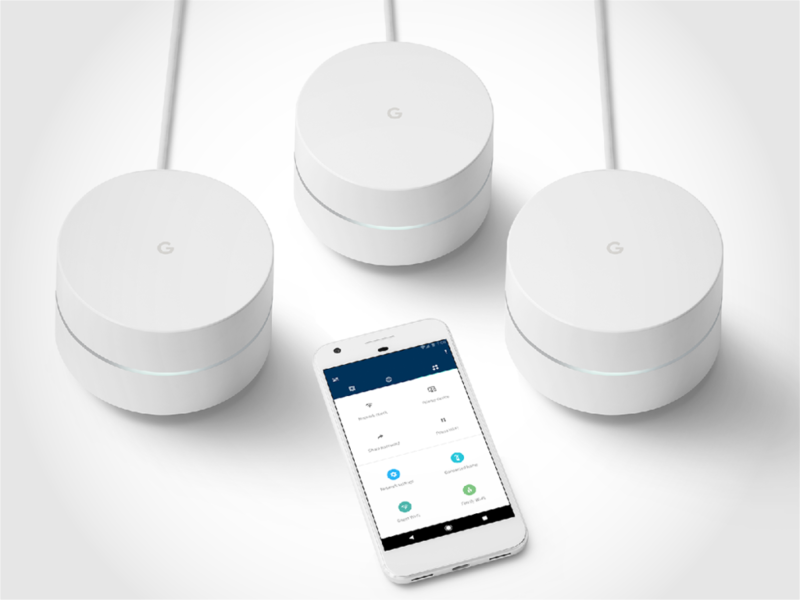 Well, if you have a big home and you have some connectivity issues you can go with this powerful router which will permanently resolve your connectivity issues and the Google wifi app is so user-friendly and gives us so many options that you can use it efficiently. You can control the timings of access to particular device or group too. It’s like dream come true for parents. WorldTopUpdates brings you this article on two important products which are amazingly interesting and surely worth buying from Google which is termed as Google Home and Google WI-FI.